Case Study: Mountain Search and Rescue in Winter in Sendai｜Implementation Case Study｜SENSYN ROBOTICS, Inc. The purpose of this proof-of-concept is to verify the usefulness of drones in search and rescue activities in daylight and night time in searching and rescuing missing persons in the mountains during winter seasons. With a hypothetical emergency call for help from a victim, we have verified that (1) it is possible to aid in quickly finding the victim by rushing the remotely operated drone to the site on automatic flight based on the location data obtained from the victim's mobile phone; and (2) it is possible to call out to the victim through the speakers installed on the drone. The proof-of-concept was conducted twice, once during the day and another after sunset. The background story for this proof-of-concept is that a skier from Izumigatake Ski Resort, Sendai was in distress. When the victim made the emergency call, his location can be pin-pointed using the "emergency call location data notification system". The drone was then rushed to the location on automatic flight after remotely setting the flight route based on the location data. 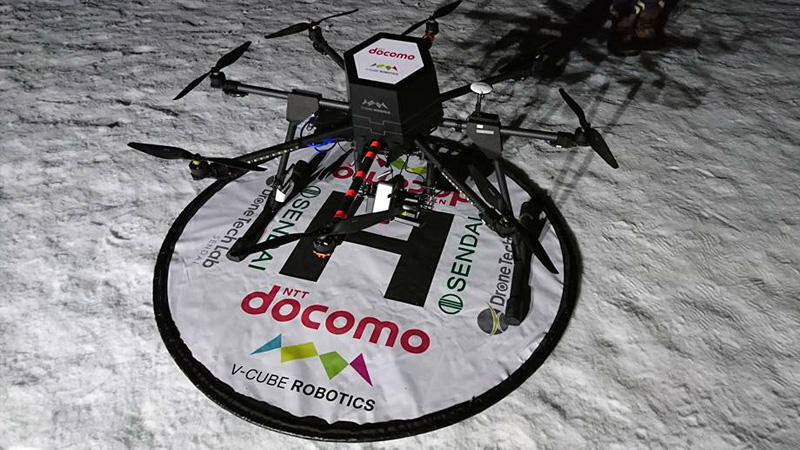 Using NTT DoCoMo's network (DoCoMo LTE) and V-Cube Robotics drone solution, the Search and Rescue (S&R) team, the local task force at Izumigatake, and the city disaster information center located in the city center searched for the victim while sharing and communicating in real time the images transmitted from the drone via LTE service. The S&R team called out to the located victim through the speakers installed on the drone until the victim is rescued. The proof-of-concept confirmed that it is possible to quickly locate the victim with appropriate directions provided to the local S&R team, as well as to guarantee the safety and to reduce anxiety of the victim with call outs, regardless of day or night by installing the drone with an optical camera during the day and a thermal camera after sunset.